The last three surviving Talgo locomotives were hard at work on the Mardid - Murcia - Cartagena route during our trip and worked far more trains than expected. Altaria 223 was a regular duty for the class and was photographed north of Riquelme Sucina behind 354 001 on 17 November 2007. Much of the freight traffic on the Cartagena line consists of block trains of green hoppers used to carry clinker, an unfinished form of cement. 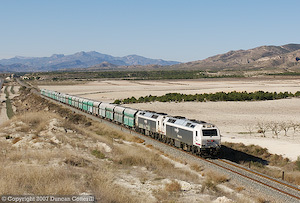 333 353 climbed to the summit north of Riquelme-Sucina with a train of empties bound for Escombreras on 15 November 2007. 334 011 led Altaria 222 up the bank away from Los Ramos-Aquerias and out of the Murcia basin on 18 November 2007. 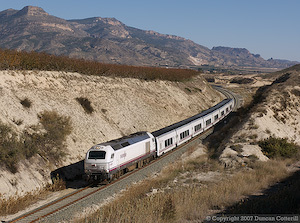 Altaria 229, the 13:06 Murcia - Madrid approached Cieza behind 334 009 on 15 November 2007. 354 008 worked Altaria 228 through the hills north of Calasparra on 16 November 2007. 334 006 was photographed on Altaria 225, crossing a bridge in barren country west of Cieza on 16 November 2007. 333 347 and 333 348 were paired up on a southbound train of clinker empties crossing the plains east of Calasparra on 16 November 2007. 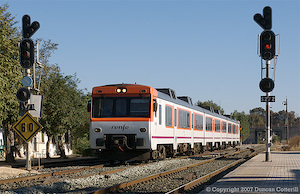 A class 592 DMU arrived at Los Ramos-Aquerias on a local service from Valencia on 18 November 2007. 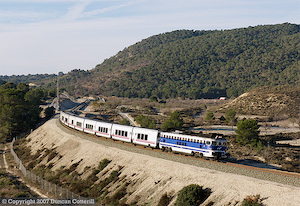 On Sunday 18 November Talgo 460, the Mare Nostrum from Cartagena to Montpellier, was photographed north of Riquelme-Sucina with 334 012 in charge. The train was formed of a double length Talgo rake on this occasion. 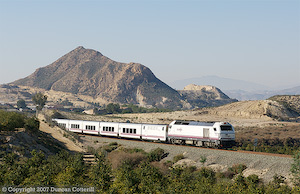 The landscape around Murcia is best suited to long trains and even a normal length Talgo or Altaria can look lost in many locations. Finding a suitable spot to photograph a single unit railcar wasn't easy but this tree made a suitable prop for a picture of 596 015 working train 4515 from Cartagena to Murcia on 17 November 2007. Mainland Spain had been off my radar since the F. C. de Ponferrada-Villablino dieselised in 1981 but the appearance of an article on diesels around Murcia by Gary Corbett in Today’s Railways Europe 138 brought the country right back onto the agenda. The opportunity for a short trip presented itself in mid November 2007 so I set off for sunny Spain with Chris Wilkinson to see what RENFE had to offer photographically. We met up with Phil Wormald in Murcia and spent four days exploring the area by car. The line we visited runs north from the coastal city of Cartagena to Albacete, on the electrified main line from Valencia and Alicante to Madrid. En route, it passes through Murcia, the provincial capital and the junction of lines south-west to Aguilas and north-east to Alicante. Just outside Cartagena, a short branch comes in from Escombreras where the oil refinery and cement works are major sources of freight traffic. The next 30km or so are fairly straight and uninspiring as the line climbs gently away from the coast. North of Balsicas the gradient steepens as the line climbs over the 258m San Pedro Pass before turning westward, dropping into the Rio Segura valley and reaching the junction with the Alicante line at Los Ramos-Alquerias on the eastern edge of the Murcia conurbation. After running through Murcia, the line turns north again at Alcantarilla, junction of the Aguilas line, and follows the Rio Segura north, climbing through increasingly barren and mountainous country via Cieza and Calasparra to Hellin. From there the route north takes the line out of the mountains and across the plateau some 800m above sea level to meet the east-west electric line at Chinchilla, around 160km north of Murcia and 18km east of Albacete . 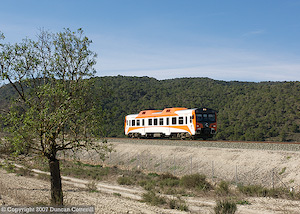 To somebody used to the one or two hourly regular interval patterns that have become the norm in many European countries, the passenger service on the Cartagena – Murcia – Albacete route could only be described as sparse. 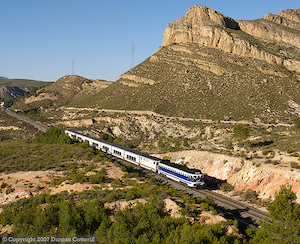 There are five pairs of trains from Madrid to Murcia on weekdays with four continuing to or from Cartagena. Saturdays are desperate with only two pairs of Madrid – Cartagena trains but Sundays are better with four pairs of trains. On mid November weekdays or Sundays that means four to six trains in daylight depending where you are. Saturday’s offer a meagre two or three daylight workings. These services are all formed of white Talgo coaches with “Altaria” branding and hauled by diesel locos of class 334 or 354. Only three of the original eight class 354s survive but we saw all of them in action during our visit with two different locos appearing on each of the three full days we had by the lineside. There are also a handful of loco hauled services running from the Murcia area to Alicante and beyond. These are also formed of Talgo coaches, this time in blue and white livery and hauled by class 334 diesels. 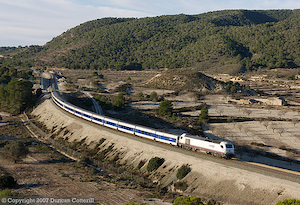 One service runs from Cartagena to Murcia and then north via Alicante and Barcelona to Montpellier. A second train starts at Lorca-Sutullena and runs via Murcia to Barcelona, while a third runs from Murcia to Barcelona. See below for a full list of locos seen on passenger workings. The infrequent regional services from Murcia to Cartagena and Alicante are worked by class 592.2 3-car DMUs or similar class 596 single cars. There are more frequent Alicante – Murcia and Murcia – Aguilas Cercanias services worked by 3-car class 592s although these don’t appear in the Hafas timetable for some reason. The industries of Escombreras generate most of the freight traffic in the area with regular block trains of clinker (unfinished cement) and liquefied natural gas heading towards the Madrid area. We also saw a block container train from the Alicante direction going north. Every freight we saw was hauled by a single class 333.3 diesel except for a southbound train of clinker hoppers that passed Calasparra around midday on Thursday and Friday and was worked by a pair of 333.3s. No freight workings were seen on Saturday or Sunday. See below for a full list of locos seen on freight workings. Photographing trains in south-eastern Spain was quite different to most places I've visited recently. The landscape had more in common with the American west than the green hills of central Europe and the trackside didn't suffer from the uncontrolled growth of vegetation found in many European countries. Another advantage was the weather, with hardly a cloud seen during the trip. Please note that written permission is required to photograph railways in Spain. I didn't expect to get many good photographs from this trip but was very pleasantly surprised. The good weather more than compensated for the sparse train service and there were plenty of excellent locations for photography. The number of class 354 workings was also a pleasant surprise. I thought we'd be lucky to see one in traffic but the three survivors actually worked around 50% of the trains we saw on the route. During the week there were enough trains to keep us occupied but with no freight and few passengers, Saturday was extremely quiet. This is definitely a line to do on weekdays. With so few passenger trains, the only practical way to get around was by car. The lack of road signs in some towns, notably Cieza and Calasparra made this far more difficult than it should have been. We missed several shots due to not being able to find the right road out of town in spite of having good maps of the area. The traffic in Murcia itself was horrendous and finding our way through the maze of narrow streets to and from our hotel each day was quite an ordeal. It was just as well our hotel had a garage in the basement as parking in the city was next to impossible. Overall, this was a very enjoyable trip and I would have no hesitation in returning to Spain in the future, particularly during the winter when the weather can be grim in much of Europe.